Oddworld: Abe’s Origins Kickstarter Funded in 48 Hours | Nerd Much? After just a few days of crowd funding, the fans have spoken. They love them some Abe. 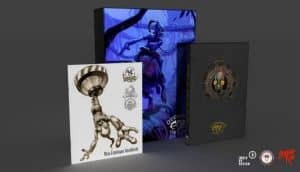 The Kickstarter campaign for Oddworld: Abe’s Origins, an premium art book and game package, has quickly hit its goal. It took less than 48 hours to successfully fund the project. The goal was to hit $63,532 by April 20th. The campaign total is currently over $75,000. The premium hard cover book includes newly found concept art, the original game design documents, interviews with the creators and more. Lorne Lanning, Oddworld co-founder, recently rediscovered many of these assets and decided to package them into this unique and nostalgic product. Indie by Design is the company handling the book development. The publisher recently handled the manufacturing of Independent By Design: Art & Stories of Indie Game Creation. A product which has garnered critical acclaim. If you browse through the Oddworld: Abe’s Origins Kickstarter, you’ll see a multitude of glamour shots for the book. And it looks pretty damn impressive. It appears hefty, so a ton of history seems to packed into it. The other part of the Oddworld: Abe’s Origins package is the inclusion of Oddworld: Abe’s Oddysee and Oddworld: Abe’s Exoddus. Both games are included on a PC DVD which is being published by Limited Run Games. The games features a DVD case that matches the cover of the book. But outside of that it comes “housed in high quality, big box PC packaging.” Those that don’t want to damage the original packaging of the two games are in luck. Limited Run Games will also be including digital codes for each title so that you aren’t forced to use the DVDs. If you’re interested in jumping aboard the Kickstarter, there’s plenty of time. For just the book, you’ll need to back about $42. For the book and the games it will run you $85. Again, you have until April 20th to be a part of Abe’s origins.